The web can be painfully slow and costly in parts of Africa, undermining young tech systems and the capacity of Africans to connect internationally. Google is planning to fix that by releasing an application that will make it lighter to browse on the web, search results optimized to save up to 40% data. The Google Go app, accessible in 26 sub-Saharan Africa countries, is customized to function on Android devices with low storage and will load on slow and unstable connections including 2G networks. At five megabits in size, the app will allow for voice recognition in search instead of typing, while easily switching between languages including Swahili. The app’s release is a piece of an acknowledgment of how high data costs, insufficient digital framework, geological areas, and shortage of content in local languages keep many Africans offline. Governments also fall short of financing projects or enabling a regulatory environment which could help remove these barriers even when they have funds, and continue to shut down internet access including in low-connected nations like Chad. The scarcity of ample data centers and routers also undermine content delivery in Africa, with websites loading from servers placed thousands of miles away in Europe or the United States. Notwithstanding this, there’s no denying mobile communication is a big advantage in sub-Saharan Africa. By 2020, there will be 535 million unique mobile subscribers in the region, up from 420 million in 2016, according to the GSM Association—a subscriber base that is growing faster than any other region globally. Internet bandwidth capacity is also growing fast while mobile broadband connections are set to reach half a billion by 2020, becoming the driving force behind innovation, financial inclusion, and access to services ranging from solar power to education, and insurance. 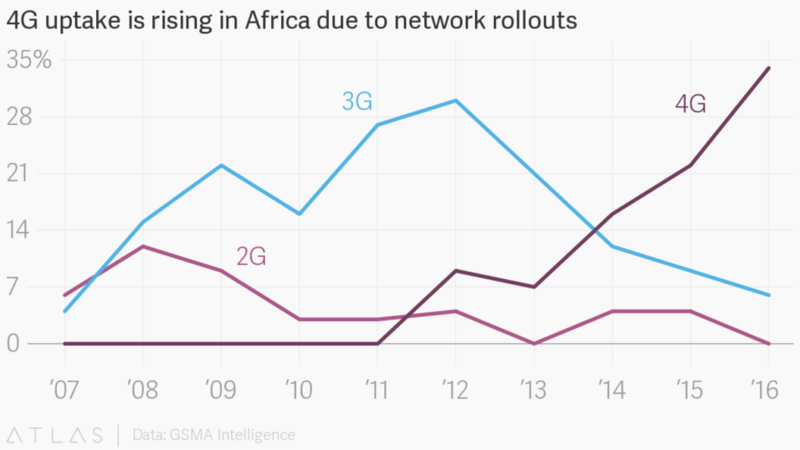 Google says it perceives the important meeting between cell phones and the web—particularly as less powerful, feature phones make a rebound in Africa, on account of the multiplication of Chinese brands Itel and Tecno. “Online isn’t somewhere people ‘go’ anymore, it’s where they live—connecting with the people, places, and things that matter to them,” Christina Lin, product marketing manager for sub-Saharan Africa, said. As more US tech companies including Facebook launch no-cost apps like Free Basics to ease internet access across the continent, advocates have sounded the alarm over the hidden cost of this connectivity. This is especially problematic in a region where local regulations might not be as effective to protect consumer data from commercial interests. Over the last few months, Google has been releasing lightweight operating “Go” systems of its popular apps for less capable phones including Gmail and Google Assistant. Last year, it launched YouTube Go in Nigeria, an “offline first” version of the video sharing platform, allowing users to preview and download videos, rather than stream, and essentially save on data costs. The latest release is also part of the tech giant’s efforts to extend its reach in Africa as it competes with companies including Facebook and Alibaba, who are all scouting for investment opportunities to deepen their operations besides providing support to more entrepreneurs and innovation hubs.